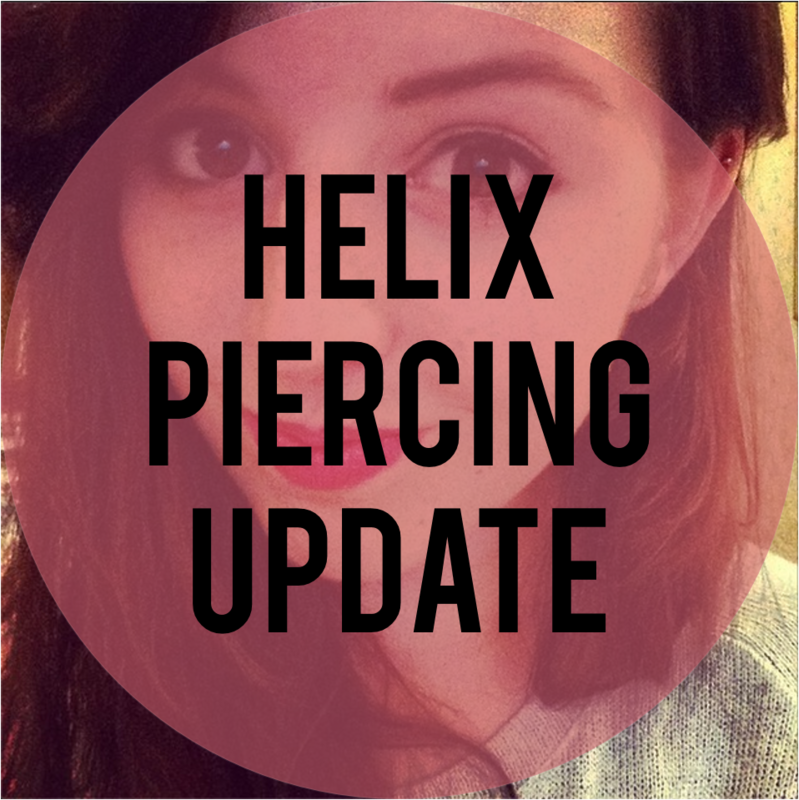 If you've been reading my blog for a while, you may remember my post back in August, where I spoke about my new helix piercing. I was so happy to get this done, and am still glad I did. At that point in time I hadn't really had any problems. However, since then it's been up and down. Let me tell you what happened! Okay, so I wrote that post in August, and everything was hunky dory. Literally, in my eyes it couldn't have gone better. However, in mid-September I caught my piercing and it started a shed load of problems. People who know me know that I like wearing rings. In fact I love them. Now, since my piercing was still delicate, I was sleeping with my hand as a barrier between my piercing and the pillow. Yet one night in September, I forgot to take my rings off before bed, and I somehow got my piercing stuck in my ring (yes, I don't know how I did it either) and pulled my hand away. Not realizing they were attached. This brought lots of tears, literally it was so painful. Worse than getting it pierced to begin with. It was bleeding too and got a little swollen. Not fun. To be honest I was more annoyed that I had just undone a month's worth of healing. After this, it was painful for a week or two, and once I'd caught it once I just seemed to catch it on everything. Then, it was getting super hot, and I got an infection for about a week which was fun. Luckily it wasn't too serious, and I got this to go by doing regular salt water rinses. (I should point out I was using salt water rinses and Claire's cleaning solution on a daily basis anyway). Once the infection was gone, it finally started to calm down a bit. During October it was really up and down, some days it would bleed, it was very crusty (sorry for details) and I noticed I had piercing bumps. Woohoo! Not. Piercing bumps occur either if it was pierced badly (it wasn't, we all know that from my last post) or if there's basically some kind of trauma to the piercing. Hmm, yup, I think my basically yanking it out of my ear might have something to do with it! I have a small bump at the front and back of my piercing, and they are very small so barely noticeable, but they do bug me, so I'm currently looking into what the best methods are to get rid of them without causing any more problems. I don't want to aggravate my piercing any more, ever! Apart from that, in the last three weeks or so I've noticed a real difference. Firstly, it no longer hurts, yay! I can also move the little bar freely backwards and forwards, no pain, or swelling, which is nice. My ear actually looks better. For the majority of September and October my ear was always red, that has now thankfully calmed down completely. I do still get crusty bits but this is perfectly normal to happen during the healing process. I have now reached the three month mark, which is in theory when I'm allowed to swap over the piercing, however since two of those months have been months where my ear wasn't very happy, I'm going to leave it until at least Christmas before I change it. I want it to be properly healed before I start messing around with it. I'm still eager to get more piercings in the future, and was thinking about getting them done in the new year, but again, I think I'll just have to play it by ear (pardon the pun) and wait until my ear has completely settled down. And the moral of this story is, don't wear rings to bed kids!